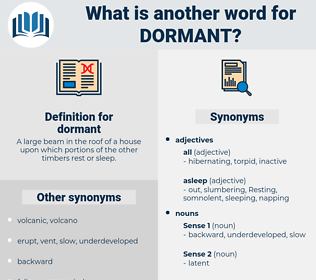 What is another word for dormant? A large beam in the roof of a house upon which portions of the other timbers rest or sleep. unrealised, nonresponsive, frozen, passive, unspent, unrealized, inoperative, unutilized, non-active, asleep, unexpended, smouldering, inactivated, latency, sleepy. practical, vertical, up, going, astir, revived, busy, workable, awakened, erect, energetic, vigorous, usable, upright, viable, running, feasible, aware, useful, Wakened, aroused, operable. The sweet perfume of a violet may revive a bitter memory dormant for fifty years! This training compels the development of powers which otherwise would probably lie dormant. 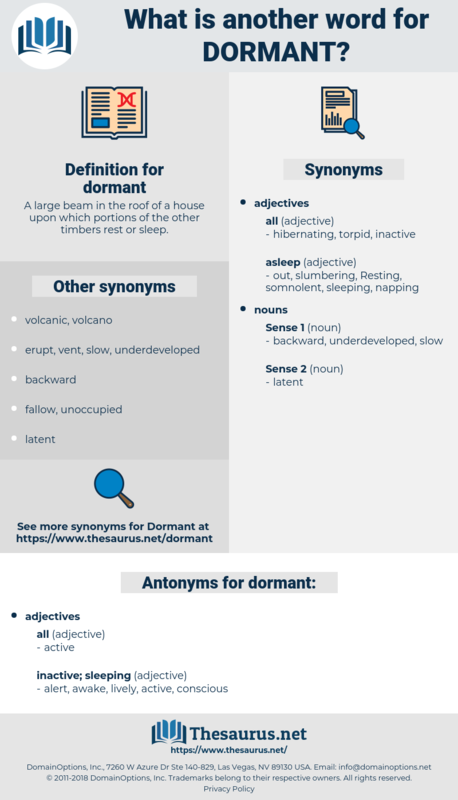 deodourant, deerhound, drawn-out, determined, deterrent, dreamed, drained, deer hunt, durant, determent, dry mouth, drowned, dairymaid, durante, drumhead, doormat, death warrant, drum out, deodorant, detriment, dry unit, durum wheat, darned, determinant, determinate, drown out, dethronement.